Vermont Sen. Bernie Sanders may not have won a spot on the Democratic Party ticket in the upcoming presidential election, but it looks like his campaign slogan will live on long after November has come and gone. 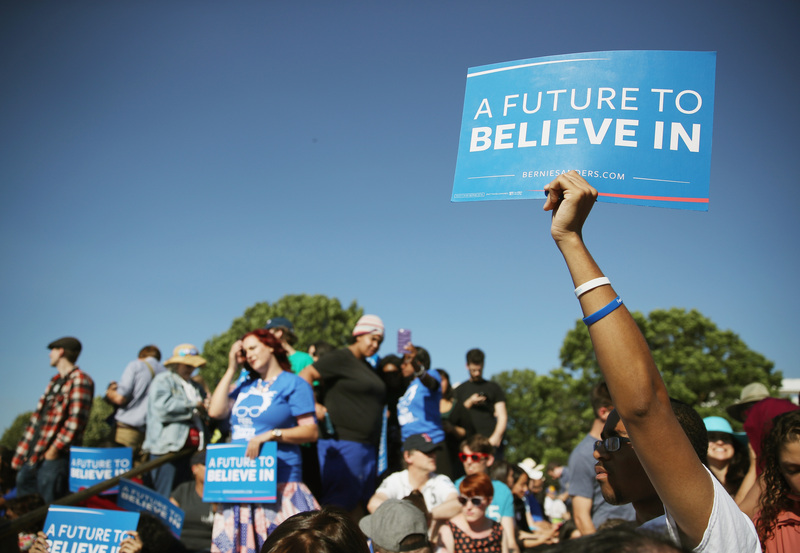 Over the last year, millions of Americans, many of them young, have fallen in love with the unlikely candidate, who calls himself a Democratic socialist. Now, Sanders' "Feel the Bern" slogan is being used to bring a different burn to mind. A nonprofit organization called AIDS Healthcare Foundation (AHF) has co-opted Sanders' slogan and logo to raise awareness for its website, FreeSTDCheck.org. The advertisements, which include billboards and banners at bus stops, use Sanders' familiar light blue background with white block text and a red and white curved underline. Instead of the expected "Feel the Bern" copy, though, the advertisements read, "Feel the Burn?" If you live in or near a major city like Washington, D.C. or Los Angeles, you may have seen the signs around. They've been up since at least late March, but they've remained relevant even as Sanders' campaign has become all but obsolete. The tongue-in-cheek billboards probably don't help Sanders' case for the White House, but they could compel young Americans to get a free STD check. AHF is currently the largest provider of HIV/AIDS care in the U.S., and it has an international presence which spans 36 countries as well. The organization operates pharmacies, thrift stores, and other facilities to support the fight against HIV/AIDS and other sexually transmitted diseases. AHF Wellness Centers provide the free STD checks advertised by the "Feel the Burn" signs. The centers are located in 10 states, plus the District of Columbia. Sanders isn't the first public figure or recognizable brand to be riffed on by FreeSTDCheck.org's creative advertisements. AHF has also co-opted Netflix's logo and the idea of "Netflix and chill," as well as the license plates and state flags of California, Florida, and Texas. The advertisements are clearly meant to grab the attention of passersby, so there's good reason for them to adopt popular graphics and catchphrases. According to the Centers for Disease Control and Prevention, young people are at an increased risk for contracting an STD. Individuals 15-24 years old account for half of all new STD cases, and one in four sexually active adolescent women has an STD. Many young Americans don't get tested for STDs or sexually transmitted infections because they don't display symptoms, according to the American Sexual Health Association, but the majority of people who have an STD may never show symptoms. In other words, a free STD check could come in handy. Throughout his campaign, Sanders promised to make college tuition free for the country's younger generations. He might not get that opportunity now that time is running out before this month's Democratic National Convention. But AHF and FreeSTDCheck.org may at least get young Americans a much-needed free checkup.